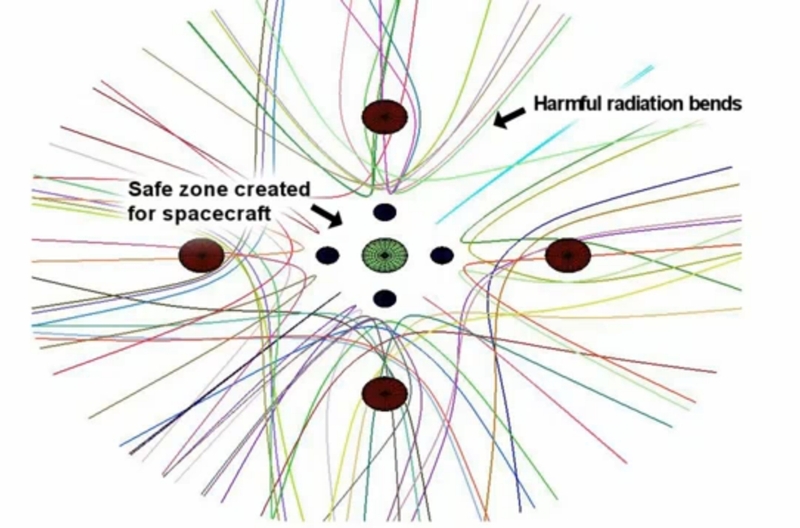 Electrostatic Active Space Radiation Shielding would redirect incoming energetic particles so as to avoid the spacecraft altogether (Credits: NASA). Spacecraft intended to carry a crew in orbit require shielding to protect their inhabitants from harmful radiation. This is usually accomplished by physically blocking energetic particles, for instance with sheets of aluminum. In order to make the shield more effective, the thickness of the aluminum is increased. One of the challenges with long duration and deep space missions is that the amount of radiation exposure quickly increases beyond accepted lifetime limits for the astronauts onboard. Ram Tripathi of NASA’s Langley Research Center thinks he may have the solution to this problem. Under the NASA Innovative Advanced Concepts Program, Tripathi is developing a concept for active radiation shielding. Instead of the passive approach of placing enough mass between the bombarding particles and personnel to diffuse radiation to acceptable levels, Tripathi proposes to use electrostatic charges to direct the energetic particles to follow a designed path, thereby avoiding the spacecraft altogether. This is a really poor discussion of the radiation problem. 1) by no means do they rely on aluminum alone or on mass alone. On the contrary: for shielding from neutrons they deliberately use lighter atoms to do the shielding; even for fast protons (the most common form of space radiation),light molecules are used to deprive the incoming photons of more kinetic energy in each collision 2) by no means is it true that to increase effectiveness, they simply increase thickness. Sometimes, they need to use alternating layers of different materials like Apollo did: it was not just aluminum. 3) the author seems to have no idea how much electricity it would take to generate a static electric field that can change the path of such a high energy electron. 4) similarly, the author seems to have no idea how much distance would be needed for the deflection to steer the protons away from the ship 5) neither does the author have any idea how hard it would be to steer ALL of them away without steering others INTO the ship. This is why active shielding is going to be difficult do to at all, even harder to do in such a way that it turns out better than passive shielding.